Most of our guests at The Peabody House and The Inn at Rose Hall know we own Lake Lucerne Cottages and the lake by the same name. 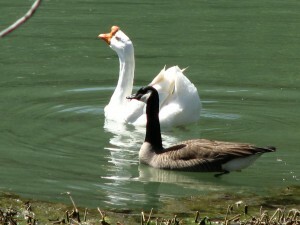 Lake Lucerne is a small 6-acre lake two miles south of downtown Eureka Springs. Over the past five years our guests have watched the waterfowl change from time to time on the lake depending upon the season. Several years ago we became the owners of a flock of domestic geese that are noisy, territorial and possessive. In spite of all of that they are very entertaining and we all love to watch their antics. Last fall we wrote about the love affair between a Canadian goose that arrived one day in the spring and one of our domestic boys. Everyone kept waiting to see if she would leave her lover and fly south when fall arrived. She did not. She stayed with her partner all winter and helped the others patrol the lake. Another pair of Canadian geese arrived a week ago and she has no interest in them at all. Wonder what spring will bring?